Mono unsaturated fats: Good for your health. Paltita avocado oil: good for your health! Extra virgin avocado oil is an extremely healthy dietary alternative thanks to its high vitamin E and antioxidant content, along with many other nutrients. The cold extraction process guarantees that the oil is a natural and 100% pure product. Its fatty acid content and other elements generally beneficial for health mean that avocado oil can be perfectly incorporated into what is today judged an ideal healthy dietary regime: the Mediterranean diet. Such a diet is characterized by foods low in saturated fats and high in monounsaturated fats, with a very low cholesterol level and high antioxidant content: avocado oil contains all the aforementioned characteristics, and thus helps prevent chronic illnesses such as heart disease, cancer, Alzheimer's syndrome, obesity, diabetes and a host of other ailments. Avocado oil has a high monounsaturated fatty acid content, with significant levels of oleic acid, which help lower levels of unhealthy LDL-cholesterol and increase levels of good HDL-cholesterol. Additionally, oleic acid promotes the ingestion of Omega-3 polyunsaturated fatty acids, which lowers the risk of heart disease. 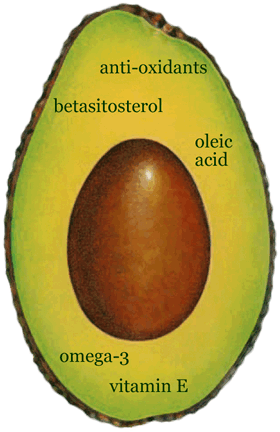 Another important component found in avocado oil is beta-sitosterol. This forms part of the phytosterol family, which research has shown to have a number of important physiological effects on health, the most important being a reduction in cholesterol levels. Vitamin E, which has a higher content in avocado oil than in olive oil, is an important natural antioxidant to help maintain healthy skin, and scientific studies have also shown that increased consumption of vitamin E helps reduce the risk of heart disease. In summary, avocado oil makes an important and wholesome contribution towards a healthy body and lifestyle. Study: health benefits of avocado oil.